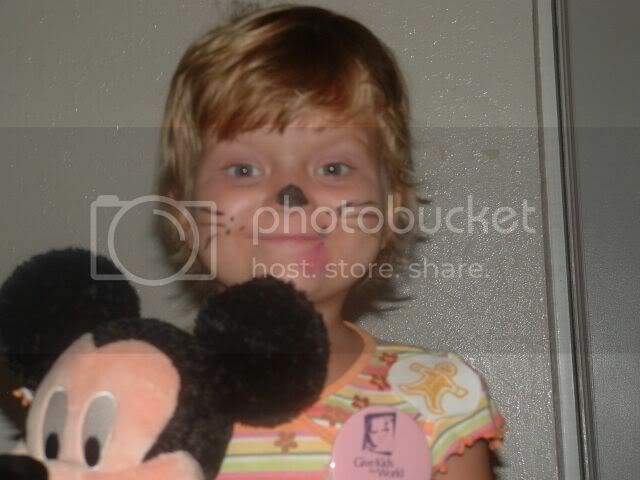 A year ago this week we were in Orlando on Catie's Make A Wish trip. It really was one of the best weeks I've ever had. I've often said that if we were able to choose one week to relive with Catie, it would probably be that week. Things got so crazy when we got home from our trip (growth on MRI was discovered within a couple of weeks, and surgery shortly after revealed the relapse) that I never really updated on our trip well. I thought I'd share a few pics this week (you've probably seen most of them on the old website already, but they're worth resharing). Here's a pic of Catie after her send-off party. She looks so tan and healthy. We drove down on Saturday. 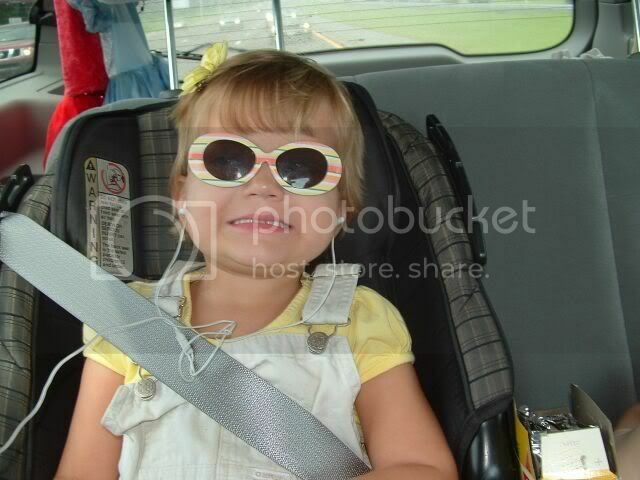 I love this pic of Catie in the back seat of the van we rode down in. She was watching a movie. We arrived at Give Kids the World late that afternoon and the first place we headed after checking in was for an ice cream cone. Their ice cream shop opens first thing in the morning and is open all day. All the free ice cream you want all day long... even for breakfast if it suits you! Give Kids the World really was amazing. Each family gets a villa to stay in -- tons of room! There is a shuttle that comes around and drops you off whereever you want to go in the Village. There are game rooms, an enchanted castle (which we LOVED), activities, a movie theater, horseback riding, swimming, a sprayground... if a kid can want it, it's probably there. Every night there is a different theme (anything from Nickelodeon night to Christmas (when it actually snows!!).... It was a wonderful place to stay and we really had a blast there. 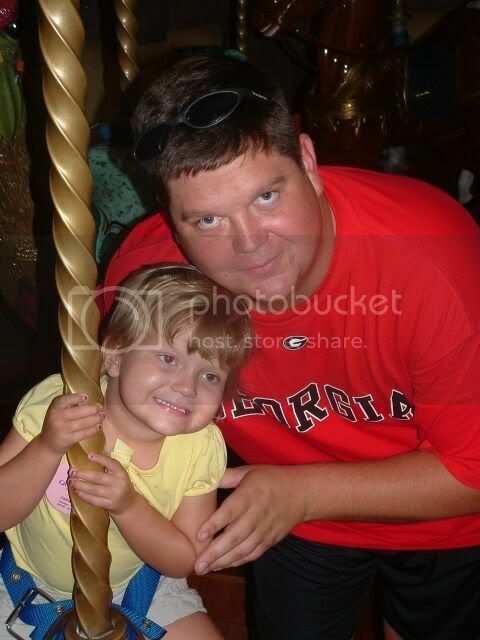 One of Catie's favorite things was the carousel. We would ride it again and again and again!!! On Sunday, we hit Magic Kingdom. Catie loved it. She especially loved the Dumbo ride and the teacups (which she convinced me to get on even though I was still battling morning sickness!!). The carousel was another favorite. 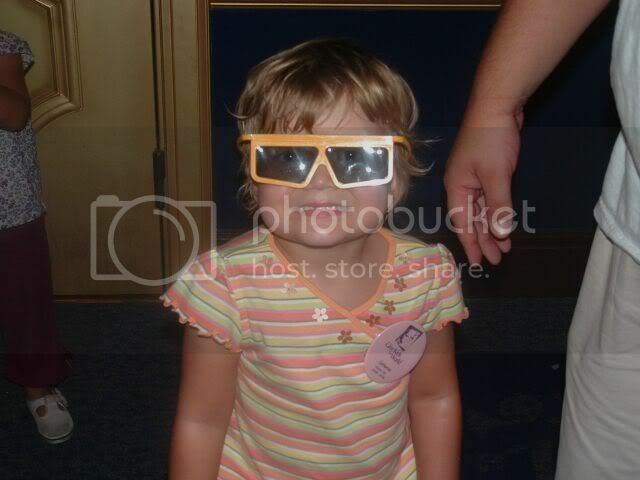 One of my favorite times that day was watching her watch the 3D show at Mickey's Philharmagic. This is Catie and Tre' while we were waiting to go in. This is her with her "cool" 3D shades! There was no meeting princesses personally that day, but she did see the coronation of Cinderella! 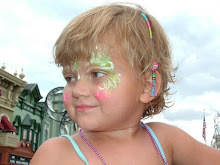 I remember it was so hot, but she was fascinated b/c right there in front of her were all the real live princesses. We stayed as long as she could keep her eyes open and made it back to the village in time for dinner and a nap. She got her face painted that night in the enchanted castle. Monday was SOOOOOOOOOOOOOOOO hot! 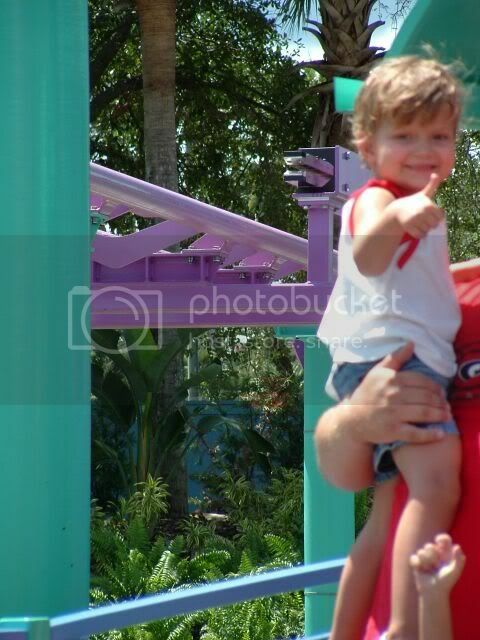 We hit Sea World that day. We probably should have saved Sea World for the next day, but we still had a good time. However, she did NOT like getting splashed by the dolphins in the show we watched!!!!!!! Not even a little bit! 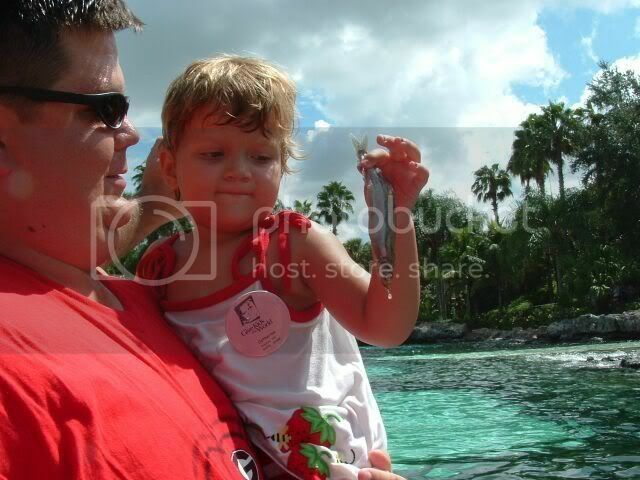 She thought the fish smelled icky, but still liked feeding them to the dolphins. She also rode her first (and only) roller coaster. I couldn't ride because I was pregnant (never mind that I hate the things!!). I was worried for her as I watched it b/c it really went fast. She got off saying it was scary and fun. 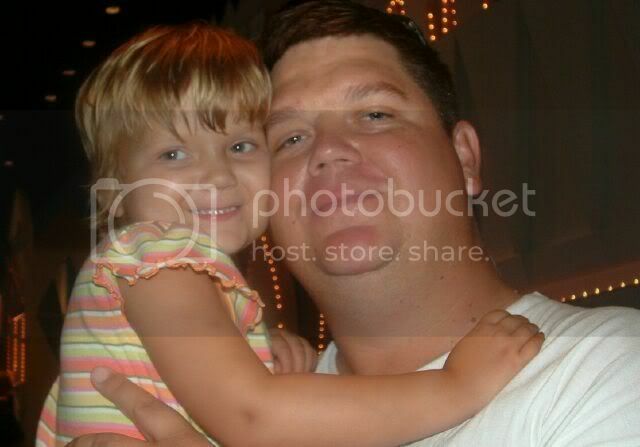 I didn't get a great picture, but this is her right after the ride as she and her daddy were coming towards me. I could not believe that she didn't get completely scared!!! I'll update on the rest of the trip later this week. It really was a blast and I'm so grateful we got to go! I can't wait until Izzy's old enough so we can go again! 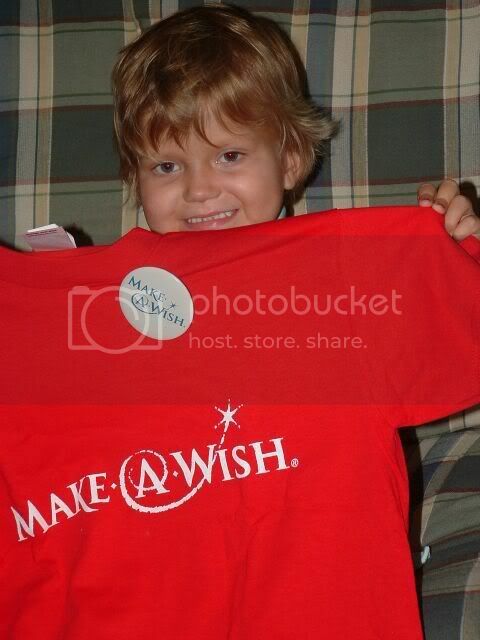 sounds like the make a wish was a dream come true!! Can't wait to hear more! what a cool trip. i'm so happy you guys were able to do that with catie, and i look forward to hearing about you going with izzy! We, too, went to Disney World and found it to be the MOST fascinating trip ever. My husband and I want to go back as well. I thought it was like stepping into a fairytale. I'm glad to hear you all had such a fantastic time. I know this is a terribly difficult time of year for you. Please know that many are with you in prayer. Oh Jenny! I love the pictures and I felt I was there as you described the pictures with a story. Catie looks so happy and I am so happy to know she truly was! We are suckers for Disney World and have been 8 times. Our children know their way around Orlando and the Disney Parks as well as they know their hometown. 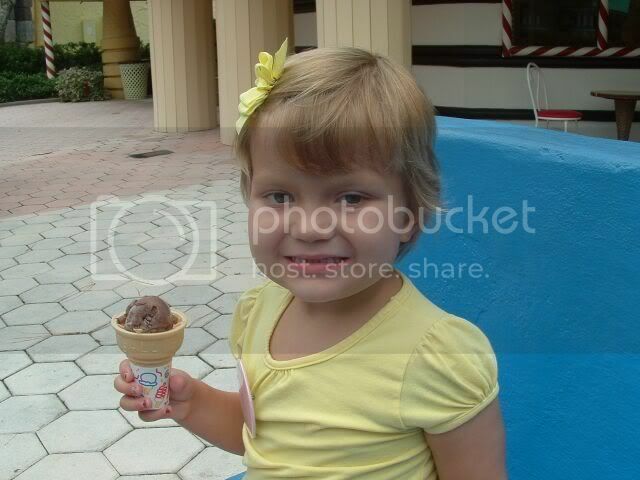 :) This past May we took our only grandchild, now 8 years old! Her grandpa and I were more excited than she was! In that land where dreams come true, there is so much joy! Even now with our grown children, we have a blast when we go. We become kids again ourselves. I am so so thrilled that Catie got to experience life in that wonderful world of imagination and creative make-believe! I enjoyed the pictures of your wonderful trip. Thanks for sharing the special memories.